We were picked up at Nelson airport on Friday morning and an hour later were 'geographically embarrassed' on the forestry roads. As per usual, reality didn’t quite match with the map. However chief guide and day trip convenor finally deduced where they thought we were by examining maps, compasses, power lines and the moss on the side of the trees (well…. not really). So our driver back tracked to find the correct road to Inwood Lookout at 1000 m in altitude. From the road end we had an easy 540 m climb to the high point on what was a mostly open ridge with excellent views… well they would have been if we weren’t in cloud. 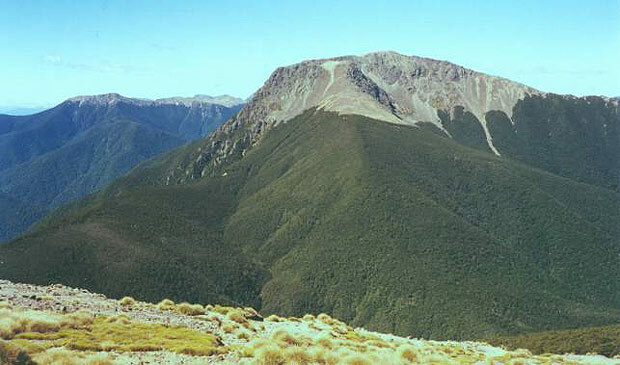 From the high point on the Gordon Range we dropped 800 metres into the left branch of the Motueka River and Hunters Hut. 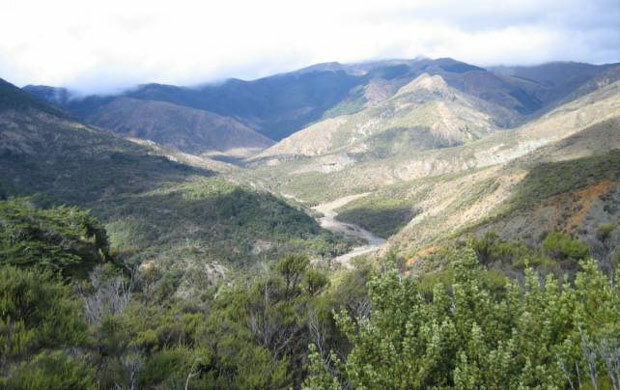 The open tops on our way down consisted of lush alpine meadow, and near the bushline a section of racked shingle. Fortunately, the bushline is marked and so we blundered our way to the forest entrance in the murk and down through the well marked forest track to the river. 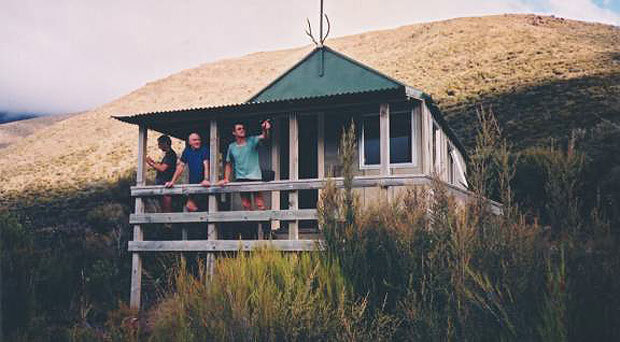 Hunters Hut is a very tidy 10 bunk hut built to replace Bushline Hut after it was washed away in a flood killing 2 DOC staff and their dogs. The new hut is well above the river on the other side, so don’t rely too much on the map. 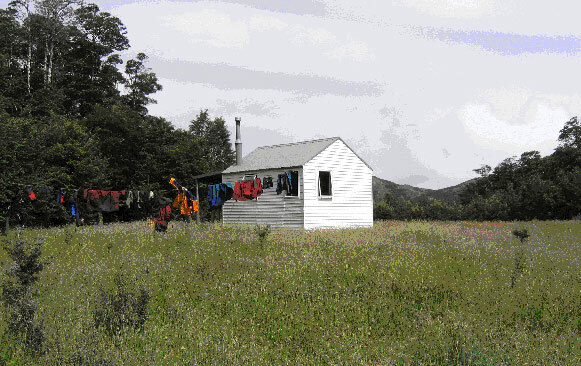 Most of the the huts are clean and tidy with stoves, pots, billies, and even camp ovens for those times when someone kills a deer……or more desperately, a possum. From Hunters Hut we had views to Mt Ellis, down into the left branch of the Motueka River, and back up to the Gordon Range. Our view ahead decided us to follow a short cut the next day by avoiding Mount Ellis and climbing up onto the edge of the Red Hills to drop into the saddle at the head of the the Wairoa River system. 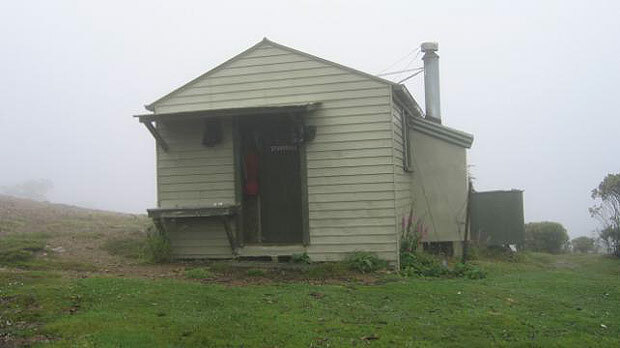 It ias also possible to climb directly up onto the tops from Hunters Hut. 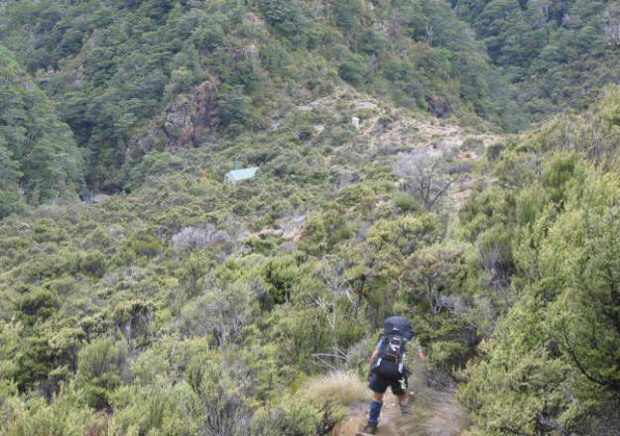 The climb out of the laft branch of the Motueka was not particularly difficult but quite slow going with big patches of purple rocks to clamber over. 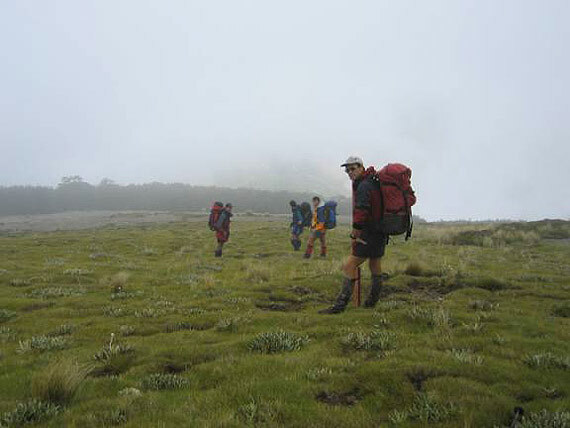 After reaching the saddle in 4 hours, for lunch, we decided that it would probably have been easier to use the track. 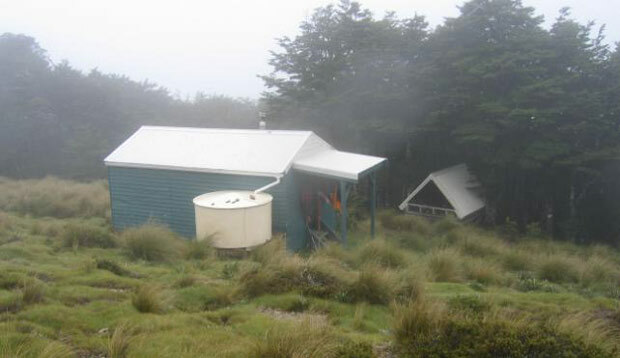 After the second half of our lunch at top Wairoa Hut the rain set in and we headed off down to mid Wairoa Hut. On the way down the river to Mid Wairoa hut we encountered lots of wasps and bees. The wasps were attracted to the honeydew on the black fungus that grows on the trees. In her haste to escape them Bev fell on a wild bees nest and things went from bad to worse, She ended up with about 30 stings while 3 of us escaped with less than half a dozen stings each. Our fifth member escaped all bees and wasps. Aside from wasps and bees the Left Branch of the Wairoa proved to be slow going - it just wasn’t a fast track. It might not be a good route after heavy rain as there are a number of crossings. 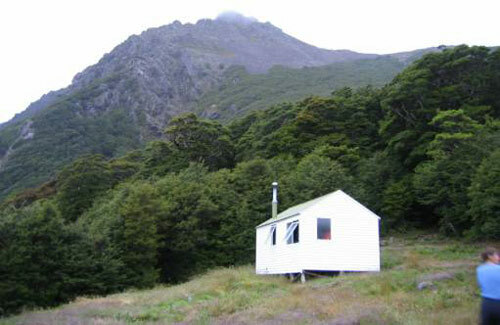 We were relieved to reach Mid Wairoa Hut by 6.30pm after an eleven hour day. 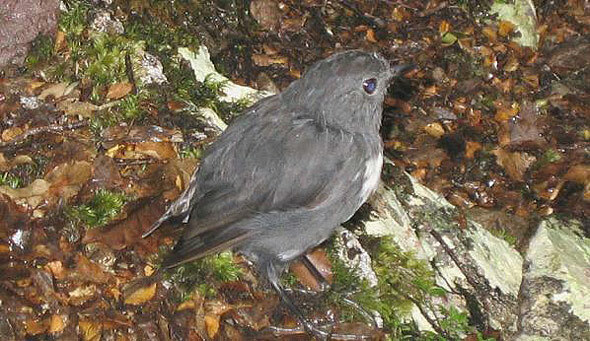 A brief, refreshing wash in the ice-cold pool near the hut livened everyone up. Next day we climbed out of the river up to Tarn Hut (4 hours) which was a really nice spot except for the rain. On the way up we still had to dodge wasps until we reached about 1000 m. Like a lot of the Richmond range huts, it is in a large clearing. Unlike the others it has a large tarn adjacent to it. The rain became even heavier after we left the hut and so we didn’t see much until we reached Rintoul Hut below the ominoius-looking Mt Rintoul. On the way there we passed through some really nice forest and over Purple Top with its great views (in fine weather). 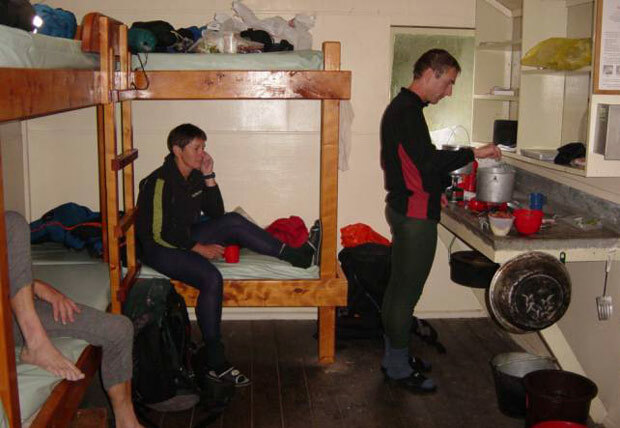 At Rintoul hut a fire was lit and we managed to get pretty dry and comfortable. Late that evening there was a clearance and we were able to see back to Purple Top. 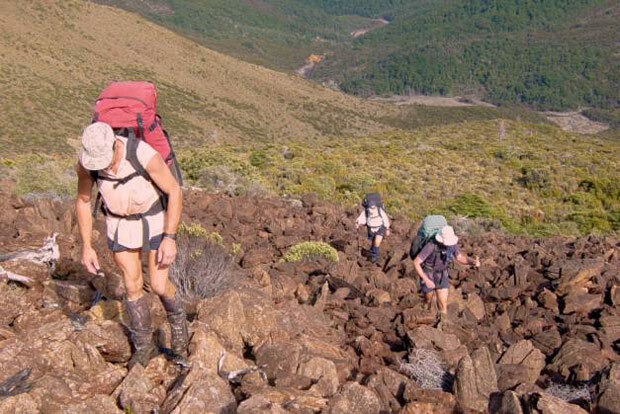 Due to the heavy rain and wind that night there was much discussion as to whether or not we would be able to continue over Mt Rintoul the next day (as it looked challenging) and what other options we had. 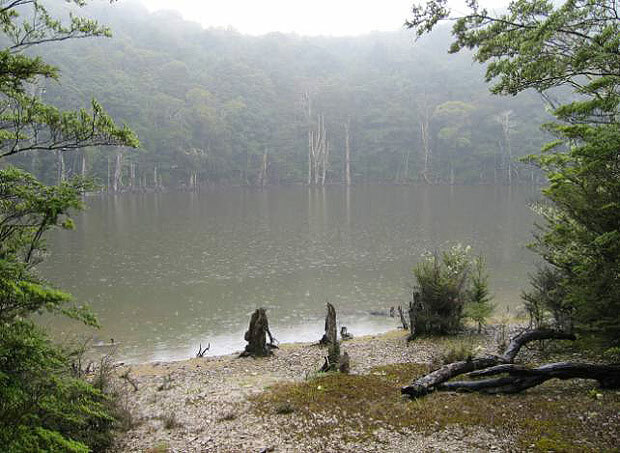 However the morning dawned misty and calm and it was not until we had crossed Mt Rintoul (1731 m) that the rain set in again. And it did rain seriously! After Rintoul peak we did a lot of sidling. It looks nasty from afar, but close up it was all pretty easy.There was only one rather difficult step under little Rintoul for which a helping hand was rather grateful (this was the only potentially dangerous part of the trip) and then it was down to Old Man Hut for lunch. 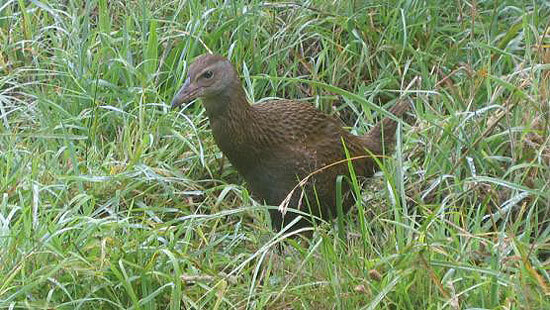 The weka's and the sun came out and we had a very pleasant afternoon drying gear on the clothes line, photographing the wekas and generally enjoying the ambience of the large grassy clearing we were in, surrounded by beech forest and looking straight up into the rocky bluffs of Mt Rintoul. The following day we climbed back up onto the ridge and followed it round to Slaty Hut for lunch and Starveal Hut for the last night. Again, unfortunately, it was another wet and misty day and we only caught tantalising glimpses of the sheer rock walls and guts below us and the peak tops looming out of the mist before us. 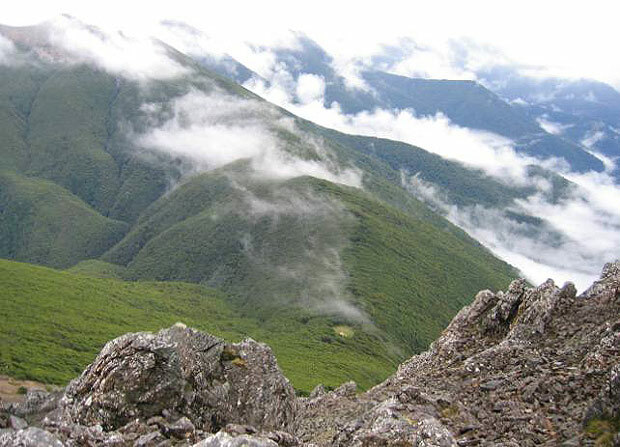 It was a mixture of saddles covered in stunted beech trees, rocky ridges to scramble up and down and broad tussock covered ridges. Just before bed we were again rewarded with a brief view back to Rintoul Hut and some of the ridges we had crossed over. Our driver was due to pick us up at the Hacketts Road end so it was an early start for the last 1100 m drop to the road end - and wouldn't you know it but the sun came out - too late for views over the park but it did mean that the picnic area at the road end was a very pleasant spot to swim, have lunch and hold a post mortem (apart from the sandflies). We were: Bev Akers, Gary Bevins, Gary Grayson, Adam Matich and Christine Scott.